I went back to Ohio this past weekend. It was a nice trip, even though Kathy wasn't with me. She stayed in Goshen because her parents were coming out for her sister's concert, which meant that I only had to visit my family instead of both families. 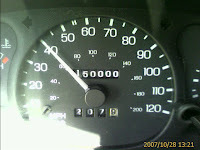 On the way home my odometer reached a big round number like you can see in the photo. I knew it was going to happen during the drive home and didn't want to miss it so I kept checking the mileage. Turns out it rolled over only 10 miles from home. I stayed at my brother's house and we stayed up late both nights... I think it was 2:30 on Friday night and 12:30 or so on Saturday night. Doesn't matter how tired I am we tend to stay up talking. November is almost here, which of course means it is time to write a novel. We're looking forward to giving it a go and see what turns up. The idea is to write 50,000 words (about 175 pages) during the month of November. The goal isn't to come up with a polished, publishable novel, but to write--to put pen to paper (or fingers to keyboard). Should be interesting. We'll keep you posted on how it is going. I'm headed to Mishawaka today and need to meet my boss soon to pick up a computer. I need to take off now. Ciao-sy. comment nº 1: I will not be having time to join you in writing a novel this november, but I like the idea. I shall be awaiting a rough manuscript. comment nº 2: not that its difficult to click the link and open up your blog from my emial, but why can´t I get your entire post in my email instead of the teaser first 2 sentences?